Super Comfort telephone headset for offices/call centers/home phones with great durability and ultra good noise cancelling mic, fully rival with Plantronics and Jabra expensive models. This headset comes with 2.5mm jack for below phone models and 3.5mm for iPhone Samsung Huawei HTC and most other Android. This 2.5mm headset comes with extra 3.5mm connector for mobiles like iPhone Samsung.... For landlines deskphone, IP phones, it ONLY compatible with models listed in Product Description. High Quality Sound: HD audio sound and clear efficient voice transmision with noise cancelling mic ensure users easy and clear communication for call centers, offices and service centers even in noisy environment. Comfort Wearing: super soft protein leathrette ear cushion user-friendly hygiene, headband 60mm easily adjustable to fit for different head sizes, ear cover rotatable,no pain no push to ears for all day long wearing. Microphone arm 330 degree rotable for wearing mic on either side. 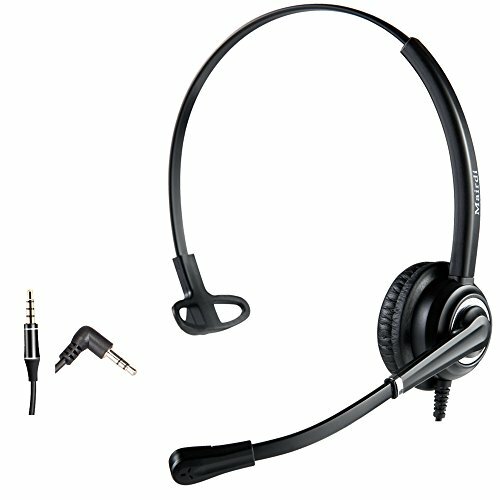 Great Durability: this headset employs top end quality speaker, microphone and reliable plastic parts make sure headset work on and on, feature with Jabra compatible quick disconnect plug allows user to move without end call or remove headset off. 2 years warranty promised on this telephone headset.If any issue pls contact us freely. If you have any questions about this product by MAIRDI, contact us by completing and submitting the form below. If you are looking for a specif part number, please include it with your message.